On Sunday, two bull moose encountered each other from opposite sides of a chain link fence on Raspberry Road in Anchorage, Alaska. They went at each other with their antlers, as moose do during mating season, but could not connect through the fence. 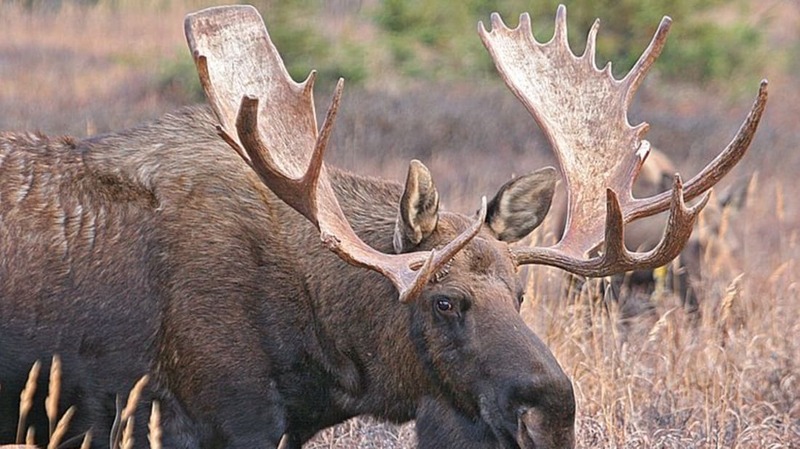 The attempted battle raged on for hours, as a crowd of officials and drivers gathered, until one moose’s antlers got tangled with barbed wire. It then decided to wander away and rest a while. At that point, a biologist was able to approach the moose and tranquilize it long enough to remove the barbed wire. There was no winner in the battle between the two moose, but the fence was wrecked. The construction project on Anthony Henday Drive in Edmonton, Alberta, is finally finished. A programmable sign says so (link contains NSFW text). The photo of the sign went viral yesterday, although we don’t know whether anyone actually complained. Transportation ministry spokesperson Aileen Machell issued a statement. It is not clear who programmed the sign in the first place, or if that person could face disciplinary action. The Edmonton ring project was started in the 1970s. The final phase of construction, on Anthony Henday Drive, has been going on since 2000. News photographers caught pictures of Norwegian prime minister Erna Solberg playing Pokemon Go on her phone while a debate was going on in parliament. At the time of the incident, Trine Skei Grande, the leader of the opposition party was speaking. While it may seem rude to play video games during parliamentary session, both women are known video game fans. Solberg had previously played Pokemon Go during a state visit to Slovakia, and Grande was caught playing the game during a government committee meeting. The man impersonating a police officer did not, at first, realize that he was pulling over an unmarked police car. He positioned his Ford Crown Victoria behind the car and turned on his lights and siren. Then he thought better of the idea and sped away. The targeted car was a police vehicle with a Montgomery County (Maryland) Police detective inside. The detective turned the tables by then pulling over the Crown Victoria. "On the exterior of the car, the detective observed red and blue grill lights, a push bumper, and multiple antennas. The detective also observed that the interior of the vehicle replicated a police car and contained items that included a center console with radio microphone, emergency lights and switches, a camera affixed to the windshield, siren, Stop Sticks, and flex cuffs," Montgomery County Police stated in a press release. The detective arrested 51-year-old John Vincent Angelini of Baltimore on charges of impersonating a police officer. A fight broke out Saturday at a Chuck E. Cheese restaurant in Miami, Florida, in which several parents from different families threw punches at each other. A 16-year-old who recorded the fight on her phone said that it all started when one diner objected to another diner looking at them. Police arrived about ten minutes into the fight and dispersed the combatants. Police have not yet released a statement on the fight. Denzel Washington (no, not that Denzel Washington) appeared in court Wednesday in Manhattan to accept a plea deal in a case in which he was accused of strangling his mother, 52-year old Aretha Franklin (no, not that Aretha Franklin). Washington was accused of wrapping his hands around Franklin’s neck and causing bruising. In the deal, he pled guilty to harassment and must complete an anger management program and stay away from Franklin. Meanwhile, Denzel Washington the actor and singer Aretha Franklin are good friends.